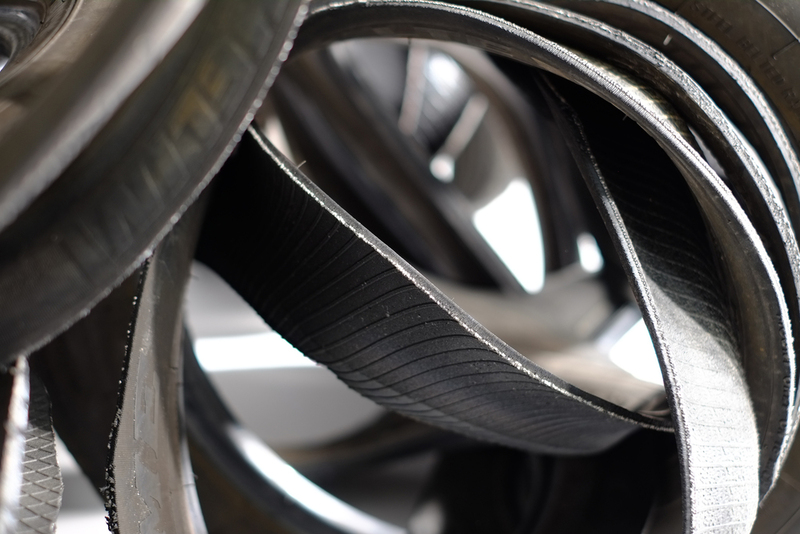 Steel belted radial tires, recycled bicycle inner tubes, zip ties. Aprrox 7' round, 2014. 10 People enjoying The Nest simultaneously. Some children enjoying The Nest. Some friends and I enjoying The Nest. 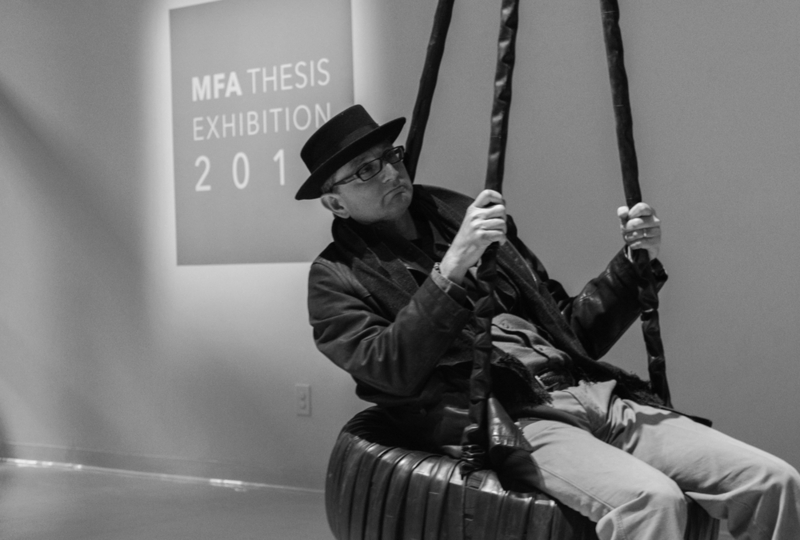 At the opening of MFA Thesis 2015, a man swinging. Recycled tires, rubber, and steel, Approx. 18 ½’. San Diego, California. 2007. With conspicuous consumption everywhere we look, I present possible solutions for our detritus. I create a glimpse into amazing possibilities for discarded things by using recycled products in my work. By fabricating familiar objects with atypical materials, I provoke the viewer to further explore my chosen media, and encourage thought about how we assign value to objects. Detail view. Recycled tires, rubber, and steel, Approx. 18 ½’. San Diego, California. 2007. "What Happened here? Where are we?" "What happened here? How did we get here?" Detail view. 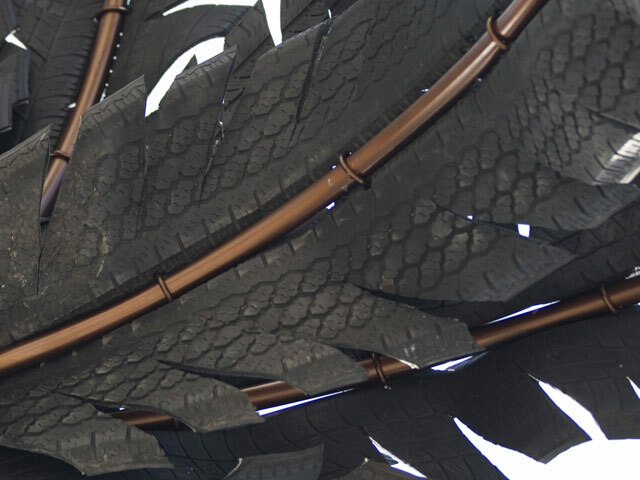 ​Recycled tires, 2013. With The Sum of its Parts, I provoke the audience to further explore my chosen media and imagery, and hope to encourage thought about how and why we assign value to objects. Manipulating materials while recontextualizing form allows me to change connotation. Surprising silhouettes and textures create a kaleidoscope of shapes and shadows that require further investigation of the material by the viewer. Being attracted to texture, wanting to touch and explore with your hands and possibly being hurt by something you feel you might trust and/or count on forces a reassessment. Recycled steal belted radial tires, rebar and rope. 2013. The hypnosis of everyday life keeps the wheels constantly spinning. In a society that is (literally) ‘driven on wheels’ I find the cycle confusing and dizzying. Life rolls on and continues just as freely as the wind blows. Installation view. Recycled steal belted radial tires, rebar and rope. 2013. Installation view. Recycled satellite dish, and plastic bags, Approx. 5’ in diameter. 2009. Detail. Recycled satellite dish, and plastic bags, Approx. 5’ in diameter. 2009. Instillation view. Recycled soda cans, and tent base, Approx. 5’ x 6’, 2008. Detail view. Recycled soda cans, and tent base, Approx. 5’ x 6’, 2008. Pillow & Blanket Detail View. Recycled supermarket bags, Approx. 3’ x 4’, 2008.